At present, the Vympel GosMKB is working to modernize the RVV-AE missile in the areas of increasing efficiency, range of damage (including through the installation of a combined rocket-ramjet engine), its technological efficiency and unification of its application in other complexes. In the future it is envisaged to equip the infrared homing missile with the capture of the target on the flight path. It is also planned to create a variant with an engine of increased dimensions to increase the launch range at low altitudes and to defeat targets such as airplanes of DRLO at ranges up to 150 km and more. Specialists GosMKB "Vympel" in the early 1990's. carried out research work "Yelnik", which showed the possibility of using an air-to-air missile of the RVV-AE type with a vertical launch. Similar work has long been carried out in the United States and Western European countries, there were developed and put into operation anti-aircraft missiles with the use of modified air missiles - the Chaparral SAM with Sidewinder 1S, the Sea Sparrow missile with the AIM-7E-2 missile and its modifications, and others. At the same time, there was no interest in this direction in the USSR, and then in Russia. However, in 2003, the Ministry of Defense of Russia issued documents that confirmed the interest of this agency to the issue of interspecific unification. At present, the State Committee for the Design and Construction of Vympel has developed an anti-aircraft version of the RVV-AE, the OCD is in full swing. The full-size mock-up of the new modification of the air-to-air missile RVV-AE in the transport-launch container is first demonstrated indiscriminately at the MAKS-2005 airshow. The new complex was initially proposed to be used for air targets from ground-based launchers that are part of anti-aircraft missile or antiaircraft artillery systems (in particular, launchers of "Kvadrat" type missile systems and launchers built on the basis of anti-aircraft guns of ZAK type S-60). In the future, the RVV-AE missile can be introduced into several air defense units of the Ground Forces and the Navy. According to the information of Vympel, RVV-AE as part of ground-based anti-aircraft complexes provides a range of range from 1.2 to 12 km, in height - from 0.02 to 9 km, according to the exchange rate - up to 8 km. This is somewhat better than for the commensurate anti-aircraft missiles of the existing short-range SAM systems. According to experts of the design bureau, the introduction of anti-aircraft missile and antiaircraft artillery complexes of the RVV-AE rocket will increase their efficiency, increase accuracy and fire performance due to the implementation of the "shot-forget" principle. In parallel with the development of the main version of the R-77 missile, it was planned to create a missile of the R-77 type with an infrared GOS, which would ensure the capture of the target on the trajectory. 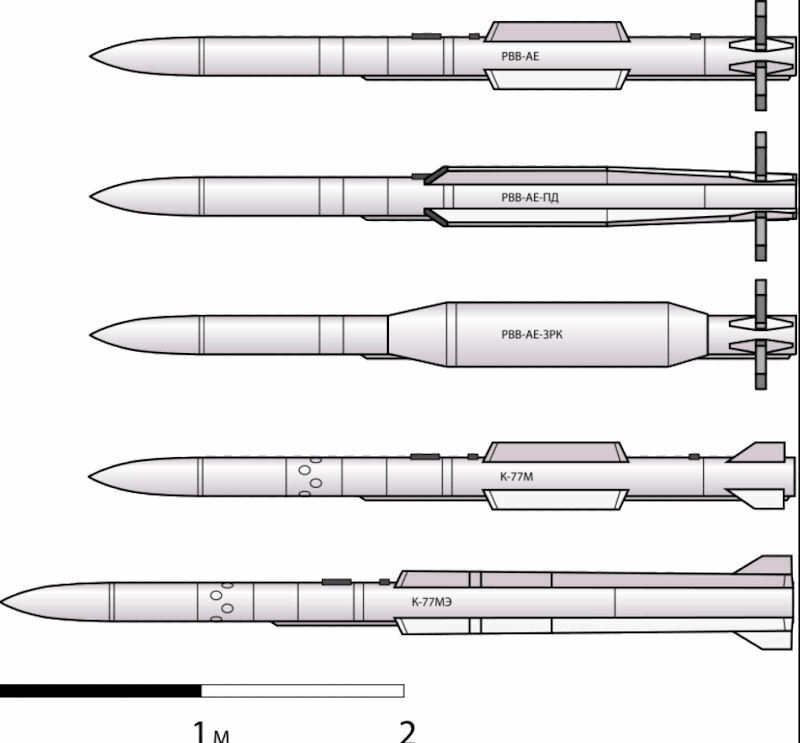 In the early 2000s, the Vympel FSUE developed three more versions of its R-77 medium-range air-to-air missile. The KB was working on the versions of the missile with the IR and passive RF (radio frequency) GOS. They were to draw up additional variants of the export model of the RVV-AE missile, which received the designations of RVV-TE (UR with IR-GOS) and RVV-PE (UR with passive radar GOS). 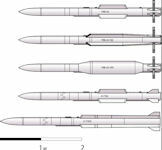 In the third variant, intended for use as an SAM, the main version of the missile is supposed to be equipped with two accelerators with solid propellant. Each of the accelerators is essentially a solid-propellant rocket from a guided short-range missile with IR guidance R-73. The considered SD could be used with a data line or without it. For guidance, it is envisaged to use the active radar homing radar from the R-77 missile. As part of the RVV-TE, it is necessary to use a more advanced GOS than the IR-GOS MK-80, installed on the R-73 rocket. At the same time, in November 2002, the Kiev Arsenal demonstrated the MM-2000 IR-GOS that could be installed on the RVV-TE rocket. According to the developer, this GOS can be installed in the body of a guided missile with a diameter of 200 mm, which corresponds to the dimension of P-77.